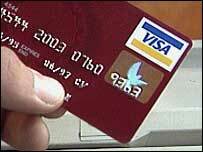 A technical hitch has affected Visa transactions across Europe, leading to some cards being declined. London-based Visa confirmed it had first noticed problems with transactions early on Friday morning. It added that immediate action was being taken to resolve the problem, but it was unable to put a figure on the number of transactions affected. Central Europe and Nordic countries have been the areas most affected by the problem. "We are currently experiencing some technical problems in our card transaction processing," Visa spokesman Simon Kleine said in a statement. "In some cases this is resulting in card transactions being declined. Immediate action is being taken to overcome this problem and we hope to have a full service resumed as soon as possible." A Danish firm that handles credit card transactions - Payment Business Services (PBS) - was one of the first to become aware of the problem. The company said it had begun to notice problems with Visa payments shortly before 03:00 GMT, with cards being rejected two hours later. Visa was unable to confirm when the system would be back up and running, however he added that the problem appeared to be minimal in the UK because a back-up system had been put in place. He added that the firm had received a "number of calls" about the problem in the UK, but that has now been declining, and customers in the UK should no longer be affected by the glitch. Mr Kleine added that the company noticed the problem mid-morning after it had begun to update its system in the early hours of Friday. I tried settling a hotel bill in Vienna this morning with my Visa card only to have it rejected. As the clock was ticking till I had to catch my plane home, I felt that good old hot flush of fear start up. Fortunately, I also carry a Mastercard which saved the day. My card was declined as I attempted to pay for petrol this morning. Luckily it was my local garage, who happily let me go with my cigs and petrol anyway, they know me well enough to know I'll stop on the way home. All very embarrassing though! What a good thing that the shop I was in still accepted cheques! !